These charts show the relative performance of Latin America emerging market country ETFs versus both the S&P 500 ETF and the MSCI emerging markets index ETF. 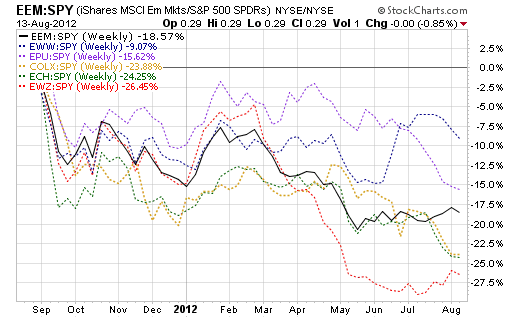 The performance of each security in these 1-year weekly charts is divided by the performance of SPY (the S&P 500 ETF). The MSCI emerging markets ETF (EEM) divided by SPY is plotted in black. 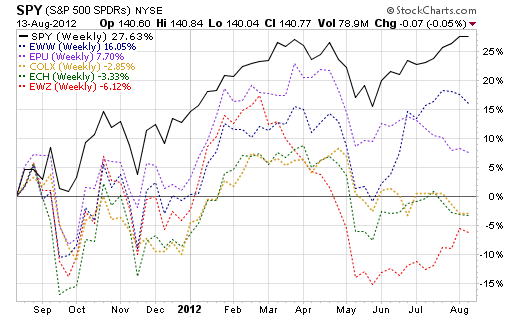 The vertical scale shows the performance relative to SPY. The position of each plot line relative to the black line shows whether the country fund did better or worse than the global emerging markets index (EEM). None of the Latin American emerging market country funds outperformed SPY over the past year. Mexico was the best of the bunch. Peru: The most significant concentration is in Peru, which has 59.9% in basic materials (mostly mining) with financial services as the second highest concentration at 26.5%. Columbia: The highest concentration is in financial services at 45.9%, and then next 42.6% in energy. Mexico: Communications services are #1 in Mexico at24.2% weight, then basic materials as #2 at 17.0%. Chile: Industrials are the heaviest weight at 28.5% with financial services at 17.8%. However, the two largest industrials are resource exporters totaling 15.43% of total portfolio assets. The Columbia fund is so small it’s almost not there ($2.7 million). Brazil is the largest non-US country fund ($7.355 billion). Mexico is the second largest non-US single country fund ($1.245 billion). Peru and Mexico are the most concentrated at over 70% in the top 10 positions. The emerging markets index fund is the most diversified (even more than the S&P 500) at 16% in the top 10 positions. Chile and Brazil have the lowest P/CF at 3.0 and 3.5 respectively. Brazil looks best on a price to book basis of 1.1 Brazil and Peru have the lowest forward P/E ratios at 10.4 and 10.6 respectively. Brazil and Chile have the lowest 5-year forward earnings growth rate assumptions at 9.5% and 9.8% respectively — more upside surprise potential. Columbia and Peru have the most aggressive growth assumptions at 23.8% and 15.1% respectively — more downside surprise potential. Chile is the most expensive as measured by the PEG ratio (1.53), while Columbia is the least expensive as measured by the PEG ratio (0.47). Peru is the second least expensive by that measure (0.70). One measure of the return you get for the volatility risk you take is the Sharpe Ratio ( 3-year total return in excess of 3-month Treasuries divided by the 3-yr standard deviation of return). Larger numbers are better. The S&P 500 has a better Sharpe Ratio than the emerging markets index of any of the Latin American country ETFs, while Brazil has the worst (most volatility per unit of return). Mexico was second best. Even though Peru has a lot going for it in the stats, we would be concerned about the populist leadership and nationalization risk, and would not own it. Columbia may or may not make sense on some level, but even if it did, we don’t like owning minimally capitalized ETFs. Mexico has its star hitched to the US wagon. Chile and Brazil and resource exporters are more tied to world and China GDP changes — Chile more for metals, energy and agriculture related products; and Brazil for oil and agricultural products. We look forward to the day when owning those two countries is once again attractive on a fundamental, valuation and price chart basis. Until China comes back as a stock story, Brazil and China are not likely to be strong. This entry was posted on Monday, August 13th, 2012 at 6:00 PM and is filed under Analysis, Data, Interesting Charts. You can follow any responses to this entry through the RSS 2.0 feed. Both comments and pings are currently closed.